After you look at Capital, Wolf, Miele,Thermador, Dacor, Viking and BlueStar, you will notice two different types of rangetops. First, are more powerful rangetops manufactured by commercial companies like BlueStar and Capital. The other type are less powerful yet easier to clean with more user friendly controls produced by residential companies like Wolf, Miele and Thermador. So in terms of rangetops, if you are comparing Miele and BlueStar, they are almost completely different in every way…so this should be a fun read. We will look at the companies, products and then compare. BlueStar is a line produced by Prizer-Painter Stove Works Inc, a Pennsylvania based company that has been making ranges since the late 1800’s. They added rangetops to their line of products in 2006. Since then, they have produced a line of high quality rangetops, including this 36” rangetop which features a stainless steel design with knobs and trims that are also customizable. 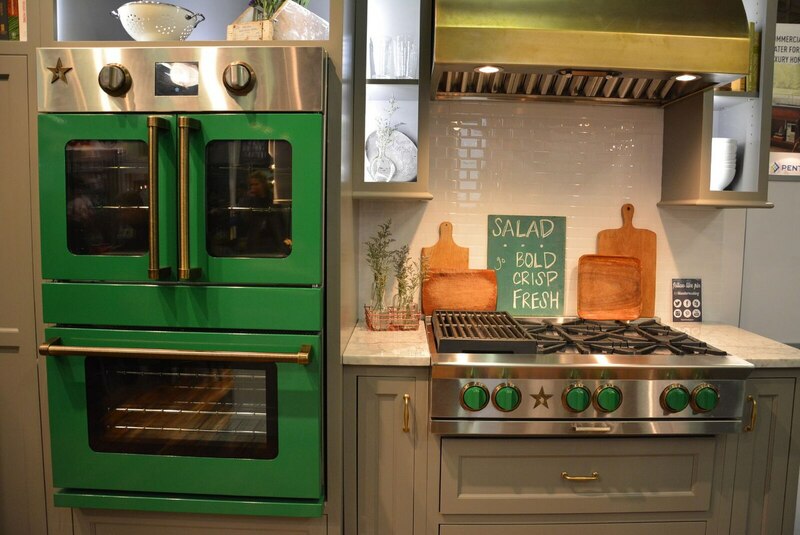 You can choose from 750 different colors and different trims on the ranges if you don’t want stainless steel. 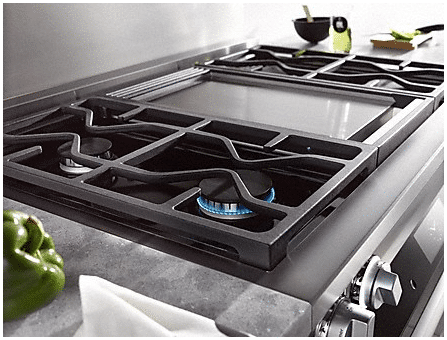 They feature an unusually powerful line up of burners as pictured above for heavy duty cooking as well as a simmer burner for low heat when needed. BlueStar has a true star burner as pictured above, with a flame shooting straight up without hitting the grates. 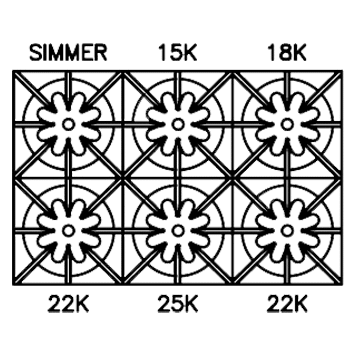 Couple this with the bowl shaped cast iron surround, and you have the most efficient and effective burner on the market. This will bring water to a boil more quickly. You can also use a wok by simply removing the top grate piece. 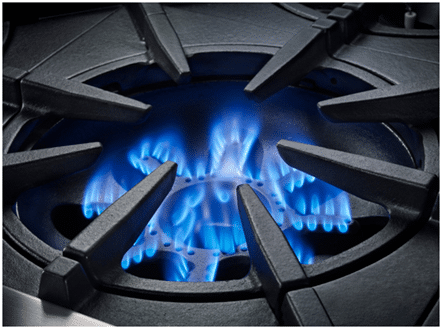 They offer open burners as well as sealed burners. They are known for their open burners, like what is used in restaurants. Cleaning is a concern with open burners. BlueStar is clever in this area. You simply wipe everything down to the bottom until it falls through to the removable drip pans below! Over time the grates can still turn grey so after scraping everything down with the green side of the yellow and green sponge, the burners can be rubbed with olive oil and put into the oven for 60 minutes at about 200 degrees. This will make them look like new practically! 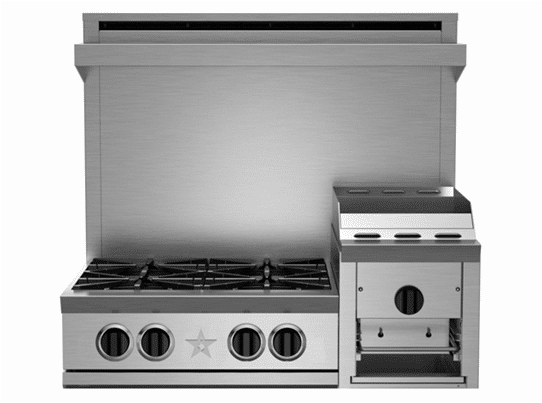 The Platinum BlueStar rangetop also features an interchangeable grill and griddle accessory pictured below, which is a decent alternative to buying a rangetop with a built-in grill or griddle in the place of 2 burners. 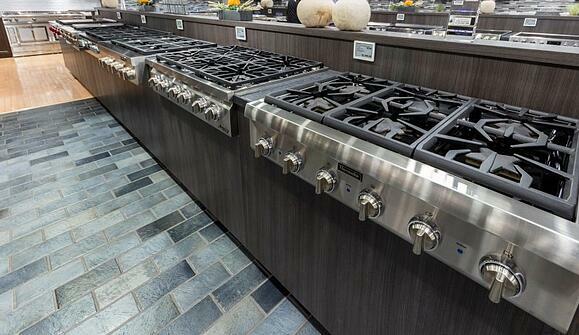 BlueStar also offers other options such as a salamander which is basically a stove top broiler and/or finisher. Salamanders are for quick searing. Restaurants use them for steaks and even the tops of Crème Brule. Miele is one of the top premium brands in the appliance world. They are known for manufacturing competence and even produce their own components.  Almost nothing is contracted out unlike most other brands. Like BlueStar, German based Miele is also over a hundred years in existence and is family owned. They distribute their products in more than 40 countries worldwide. This range boasts of a simple but elegant design that affords users accessibility and a wide range of options, including six 19,500 BTU burners with automatic re-ignition. The high-output burners require you to oversize the hood by 6 inches on each side of the rangetop before the upper cabinets start. Miele is the only manufacturer with that requirement. One of my favorite features is that the knobs light up when activated. The front is what Miele calls clean touch steel, which is a coating for less fingerprints. The grill is infrared gas. It is the closest to an outdoor grill in a rangetop. The griddle is also infrared and is thermostatically controlled for even temperature. So when you are cooking pancakes, you can flip them anywhere on the griddle. The burners are all dual stack burners, which means that the simmer is very low, as it is a separate small burner at the base of each burner. Well, both companies are family owned. The similarities end there. Miele is sealed so spills are contained on the unit, whereas they can drip down on a BlueStar. However, in an open burner, you can disassemble the unit and clean it at the sink. 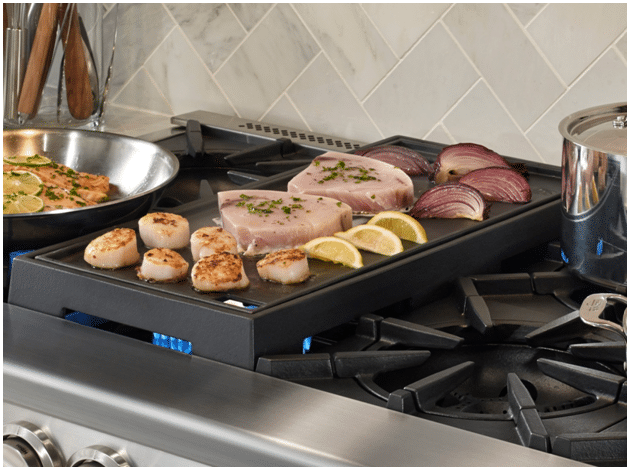 BlueStar is the most powerful cooktop on the market. 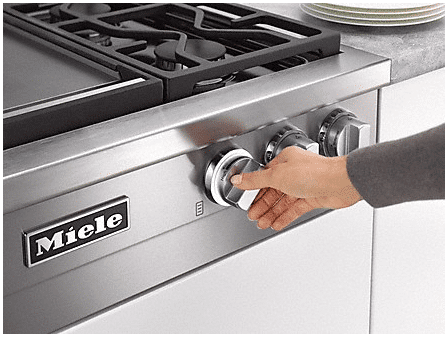 Miele is actually pretty good with 19,000 BTU burners, but BlueStar tops out at 25,000. Miele is infrared and best in class (along with Wolf). BlueStar is essentially just a plate. The Miele is the most even, but BlueStar is not bad, because it is so powerful. The heat should transfer over. It depends on how you cook. If you want power, then BlueStar is the best unit sold. The griddle/grill functions are appealing in the Miele. Look at both for how they clean, because they are so different. Looking for more information on Professional Gas Rangetops? Get the Yale Professional Range Buying Guide with specs, BTU outputs of all the major brands as well as the new major features. Well over 195,000 people have read a Yale Guide.